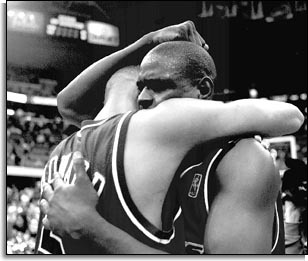 Welcome to my webpage devoted to the Washington Wizards all-stars duo , Chris Webber and Juwan Howard. I'm a BIG fan of this FAB duo ever since their days at Michigan where they lead the team to two NCAA Championship Finals.Now,they seems to be having the same impact with the Washington Wizards team.Chris Webber is a 6-10 power forward with the flamboyant coast-to-coast game the stuff of highlight films while Howard is a 6-9 small forward with the fundamentally sound game the stuff of chalkboards. Since I'm a NBA card collector and a big fan of Howard & Webber,I'm looking cards on these two players. Please e-mail me if you have their cards or any other rare stuffs like posters or stickers...etc. I'll try to put up a wantlist as soon as possible,at the meantime please contact me at yeowh@pl.jaring.my. I'm especially interested in their two-player cards like Finest Dish & Swish and Stadium Club Class Act. Thanks for visiting this page! Juwan Howard is a fundmentally sound forward is willing to quietly do the dirty work in order to help the team win.Howard is one of the best jump- shooting forwards in the league.Whenever running the fast break with Webber, Howard is often the one delivering the alley-oops passes but can also finish with authority. Chris Webber is one of the most versatile power forward in the league.For a guy like his size,he can move extremely quick and pass very well.Webber's game is all about flair as he loves to finish fast-break plays with behind-the-back dunks.Although Webber was recently hampered by injuries. he has showed that he is truly back in his old form.Webber is also one of the best defensive forwards and is the cornerstone of the Bullets' success. 6/25/97-Wizards Capitol undergo it's first major changes and got a fresh new look.Lots of stuffs added like guestbook,polls and much more links than before. Notice:This page is under major changes!! !